For the most part I still quite enjoy most of the letterforms, but certain others don’t seem to work. The S’s, for example, feel incomplete. And the upper halves of the B and R sit awkwardly atop their lower halves. The lowercase h and n are not right either. So I have to wonder if the designer didn’t do enough to create a true family here. 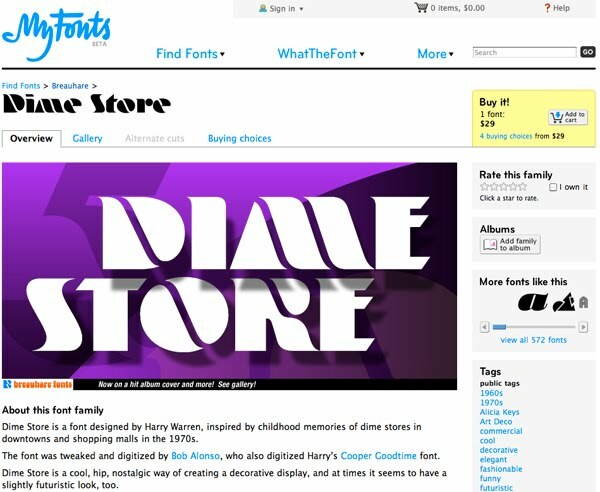 i'm not a fan of the overall design - lowercase "the" but then a capital "OF" and a different font for "freedom" - but since it's the initial "Dime Store" font we're talking about here, i like it. it has a melodic kind of flow to it and represents Ms. Keys' music quite well. That K is as wide as the Y and S together. And the slanted ends on the L, T and E just make them look they're a different font alltogether. I think it's messy. The weird teardrop on the "R" is going to drive me crazy for the rest of the day. That is one ugly letter. 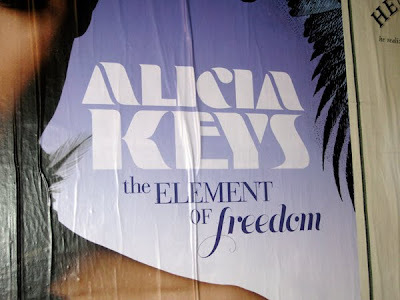 So it seems like part of the magic of the Alicia Keys is that the designer used the right letters for the job at hand! If her name was Balecia Reyes, it could have been a catastrophe.